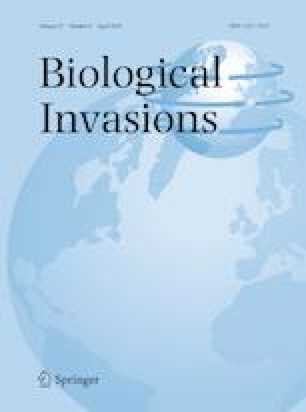 Although conservation managers usually have to deal with multiple invaders that co-occur in native ecosystems, research to date has concentrated on the study of single highly invasive species. Consequently, this study aims to better understand the interactions among co-occurring alien plants. Specifically, I aim to determine how relative performance in mixture (compared to monoculture) depends on phylogenetic relatedness and similarity in functional traits. I investigated interactions among 18 alien annual plant species in Germany from six families in a multi-species common garden experiment, where plant individuals were grown in all pairwise species combinations. I measured growth, reproductive output and functional traits of the species, and determined phylogenetic and multivariate trait distances (representing niche differences) and individual trait hierarchies (representing average fitness differences that determine competitive superiority) between pairs. Across the 153 interspecific species combinations, individuals equally often experienced higher intraspecific or interspecific competition, with competitive responses varying greatly depending on species. Hierarchical differences in individual traits affected growth and seed production: being taller, having larger seed mass and higher specific leaf area benefitted relative performance of alien species when co-occurring with other aliens. Multivariate trait distance also had a positive effect on relative aboveground biomass production in mixture. Overall, hierarchical trait differences related to competitive ability appear to be more important than niche differences in determining performance for co-occurring alien plants. A better understanding on interaction type and strength among multiple plant invaders is crucial to determine appropriate management actions and contributes to ecological theory of community assembly. The online version of this article ( https://doi.org/10.1007/s10530-018-1884-z) contains supplementary material, which is available to authorized users. This research was financially supported by the German Research foundation (grant SH 924/1-1) and the Baden-Württemberg Stiftung within the Eliteprogramme for Postdocs. I am grateful to B. Springer and A. Doeker for their assistance with the common garden experiment. Thanks to the botanical gardens of the Universities of Konstanz, Gießen, Halle-Wittenberg, Hohenheim and Mainz for providing seed materials used in this experiment.